We started our walk from Nine Barrows Lane in Priddy up the field towards the Ashen Hill barrows on the left and in sight of the Priddy Nine barrows on the skyline. There are 400 round barrows on Mendip, dating from the Bronze Age (2500-750BC). The barrows would have contained a single inhumation in a stone-lined cist, sometimes with grave goods, or a cremation in a collared urn. On Mendip the barrows tend to be clustered together in small nucleated or linear cemeteries. The typology of most of the barrows on Mendip are ‘bowl’ barrows. Grave goods from the Ashen Hill barrow group include flint arrowheads and broken pottery. The Rev. Skinner, who had dug into most of the barrows on Mendip, discovered an amber bead with a bee inside, broken pottery and tanged and barbed arrowheads. Skinner collected artefacts for Bishop Law, the Bishop of Bath & Wells, but unfortunately none of this collection survives. From the Nine Barrows there were beads of amber, a pottery ‘grape’ cup, flint knives and scrapers, a flint spearhead, a bronze dagger and broken pottery. From other barrows on Mendip grave goods include amber beads, amber headed pins, patience beads, jet and shale beads and collared urns. 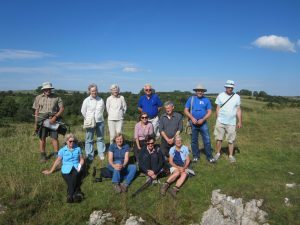 The University of Bristol Spelaeological Society (UBSS) examined many of the barrows and recorded them and Leslie Grinsell did the definitive recording and publication. 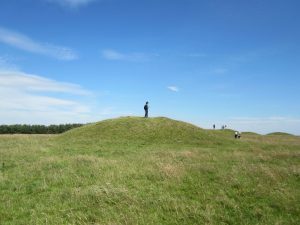 The Ashen Hill barrows and the Priddy Nine Barrows are concentrated along the western ridge of the Mendip Hills, close to other major monuments such as the Priddy Circles, Gorsey Bigury henge and not too far from the stone circles at Stanton Drew. They would have been part of a ritual complex found on Mendip and their location may have been chosen at high points in the landscape, giving views towards other Bronze Age sites, such as the nucleated cemetery at Beacon Batch. In the Bronze Age emphasis was on the individual and on burial with grave goods. Unfortunately, there are no radiocarbon dates for the barrows on Mendip. Many of them today sit on the current parish boundaries and may have been territorial/boundary markers in the Bronze Age. We climbed a steep, stony track towards the Totty Pot swallet hole. 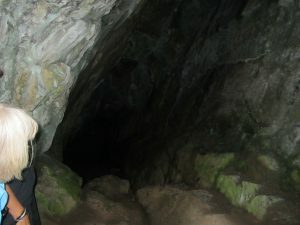 Caver, Chris Hawkes discovered the cave in the early 1960s when having a picnic with his family. Totty Pot is named after his toddler daughter Sarah, who helped bring out soil from the shaft entrance with her potty. Chris and members of the Wessex Caving Club dug out the cave over the next 5 years, together with Willie Stanton, a local geologist. Archaeology was not expected to be found and it was a surprise when microliths revealed themselves on the spoil heap after a weekend’s rain; human bones also began to appear in the buckets of mud brought to the surface. The human bones were reported to the Leicestershire police (where Chris was living) and the great misfortune for Mesolithic archaeology is that they regarded the finds as too old and unimportant and subsequently incinerated them. Fortunately some of the human bone has survived and a radiocarbon date of 8320 ± 69BP confirmed the site as Mesolithic. The flint collection includes microliths, with little debitage. There was some early Bronze Age pottery and a piece of quernstone (now lost). 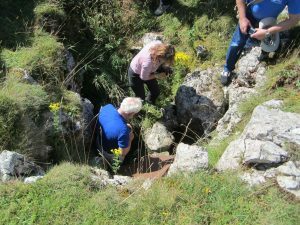 Paula Gardiner returned to the site in 1998 and carried out an excavation around the mouth of the swallet hole to see if there was any evidence of occupation. She also dug into the remains of the 1960s spoil heap and recovered 2 microliths and some animal bone. From 2 of the trenches 5 microliths were found, but there was no evidence such as hearths that might suggest occupation. Recent radiocarbon dates show that there one adult individual dated to the Mesolithic, with a MNI of 5 individuals dated to the Neolithic. 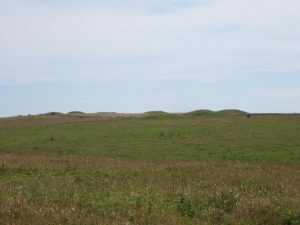 Totty Pot was a Mesolithic burial site that continued in use into the Neolithic, albeit with a gap of several thousands of years. It is not thought that the bodies were washed in, but it is not known from the 1960s excavation, if they were disarticulated before being placed in the cave. This seems likely as access was down the narrow entrance shaft. 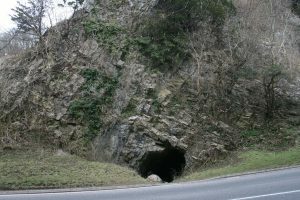 Totty Pot can be linked with other Mesolithic sites on Mendip, such as Gorsey Bigbury, Rowberrow Cavern and Hay Wood cave, Hutton. Mesolithic people from Birdcombe in North Somerset, may also have used the cave for burial. Totty Pot is located on one of the highest points of Mendip with a 360o view over the Somerset Levels and the Mendip plateau behind. Its extreme location suggests a special place for burial was chosen well away from any settlement and this focus continued into the Neolithic. 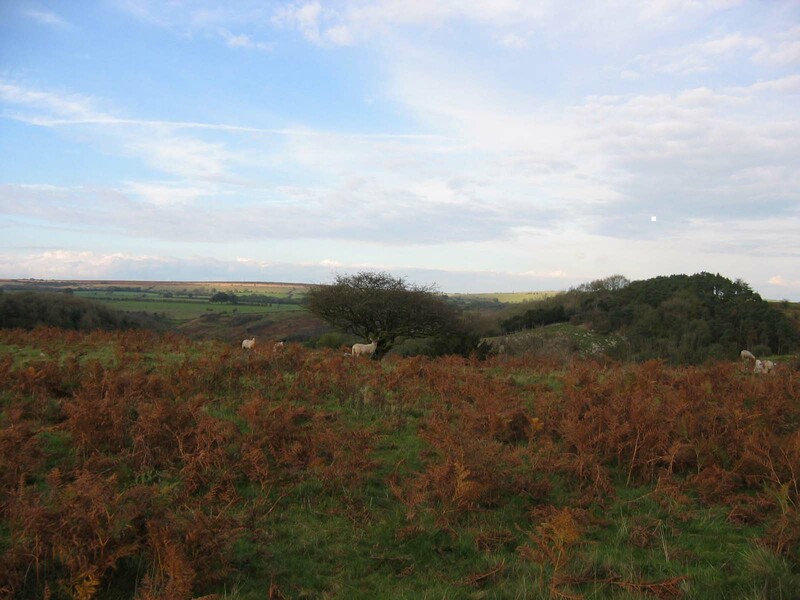 Returning to Burrington Coombe, we visited the entrance to Aveline’s Hole. This cave was discovered in 1797 when two boys chasing a rabbit, removed rocks to the entrance and found 50-100 skeletons lying “promiscuously” near the entrance and covered with a black humic material. Subsequent excavation by Prof. Boyd Dawkins and the UBSS removed further human remains and artefacts. The artefacts include flint from both the Upper Palaeolithic (Cheddar Points) and Mesolithic, 7 ammonite cases, periwinkle shells, a fossil gastropod and a small barbed point of reindeer antler. Unfortunately most of the finds were destroyed in the Bristol Blitz, although a small quantity of human bone and some of the artefacts survived. In 2004, Graham Mullan, Linda Wilson and Tony Boycott discovered geometric art at the end of the cave. Although there are no dates for the art, it is believed to be Mesolithic by analogy with Scandinavian art. Aveline’s Hole is an important burial cave that was used for some considerable time in the Mesolithic before final closure. Much earlier the cave was used as a hunting camp in the Upper Palaeolithic. It is one of the group of very important burial caves on Mendip, with Gough’s Cave and Totty Pot.